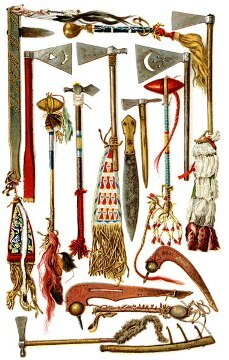 Description and Definition of the Pick Axe: The Pick Axe is the name given to describe one of the many different Types of Native American War Clubs used during Indian warfare and combat and as a useful tool. The name of the Pick Axe was so-called because this weapon resembled the shape of the beak of a bird. The word 'pick' derives from the Latin word 'picus' meaning "woodpecker." The Pick Axe style of war club was made of either stone or metal blades. The Pick axe style of war clubs had a sharp edge on one side and a diamond shaped point on the opposite side. Some styles of pick axe had a blunt edge used for striking rather than cutting. The blades were attached to a wooden handle and are illustrated in the pictures of pick axes shown on this page and measured between15-20 inches long and weighed about 3 pounds. The stone Pick Axe blade was characterized by its useful point. A suitable piece of hard stone, called Flint, was favored by the Native Americans although other hard stones such as chert, jasper, chalcedony, granite, basalt and sandstone were also used to make axes. The original piece of flint, called the core, was struck and smaller sharp flakes of stone were produced in the required thickness for the pick axe. 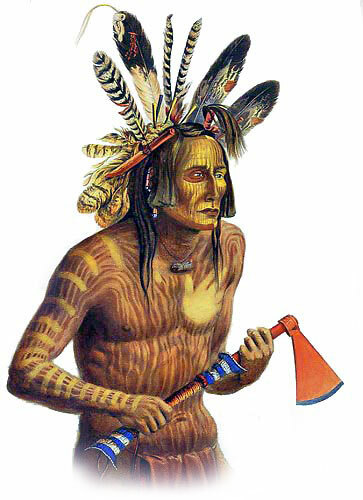 The Indian would then shape, refine and create a pointed weapon, such as a pick axe. A pre-prepared a wooden handle was attached (hafted) to the pick axe head using sinew or rawhide as lashings to attach the handle to the axe. The shape of the stone or bone determined the design and style of the finished pick axe weapon or tool.